Bone conduction hearing solutions convert sound into vibrations that are transmitted to the skull and subsequently the hearing ear. Traditional hearing aids amplify air conducted sound and output air conducted sound directly into the external ear canal. Persons who have normal hearing or minimal hearing loss in one ear and are deaf in the other ear. Persons with uncorrectable conductive hearing loss but a normal inner ear. Traumatic defects of the ear. A bone conduction hearing solution does help with direction of sound when one ear is normal and the second ear has a normal inner ear but a dysfunctional middle ear conductive system. 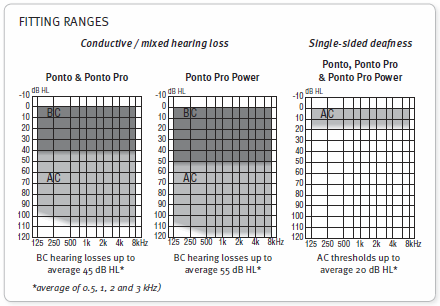 The bone conduction pure tones in the better ear must be equal to or better than 45 dB for 500 to 3000 Hertz. The patient should be unable to wear a hearing aid in the deaf or poorer hearing ear or a hearing aid should be an unacceptable nuisance in the poorer ear.